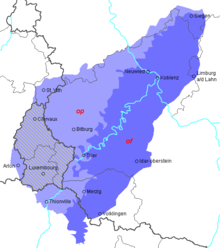 Luxembourg (/ˈlʌksəmbɜːrɡ/ ( listen); Luxembourgish: Lëtzebuerg [ˈlətsəbuə̯ɕ] ( listen); French: Luxembourg; German: Luxemburg), officially the Grand Duchy of Luxembourg, is a small landlocked country in western Europe. It is bordered by Belgium to the west and north, Germany to the east, and France to the south. Its capital, Luxembourg City, is one of the three official capitals of the European Union (together with Brussels and Strasbourg) and the seat of the European Court of Justice, the highest judicial authority in the EU. Its culture, people, and languages are highly intertwined with its neighbours, making it essentially a mixture of French and German cultures, as evident by the nation's three official languages: French, German, and the national language, Luxembourgish (sometimes considered a dialect of German). The repeated invasions by Germany, especially in World War II, resulted in the country's strong will for mediation between France and Germany and, among other things, led to the foundation of the European Union. Luxembourg Airport at Findel, some 6 km to the north of the city, is Luxembourg's only commercial airport. Thanks to its long runway (4,000 m), even the largest types of aircraft are able to use its facilities. This is a list of railway stations in Luxembourg. Luxembourg has a well-developed railway network, due in part to its heavily-industrialised iron- and steel-producing Red Lands, which are particularly well served. As a result, most towns with over a thousand inhabitants are served by at least one station (and, in the case of Luxembourg City and Dudelange, four). The flag of Luxembourg (Luxembourgish: Lëtzebuerger Fändel, German: Flagge Luxemburgs, French: Drapeau du Luxembourg) consists of three horizontal stripes, red, white and blue, and can be in 1:2 or 3:5 ratio. It was first used between 1845 and 1848 and officially adopted on 1993. It is informally called in the country, «rout, wäiß, blo,» (lit. red, white, sky blue). ... that DNA testing suggests that Loschbour man, an 8,000-year-old human skeleton found in Luxembourg in 1935, had dark skin? ... that to receive a work permit to play in Luxembourg, Bosnian footballer Sanel Ibrahimović had to pretend to be a specialist in his country's cuisine? Do you have a question about Luxembourg that you can't find the answer to? For editor resources and to collaborate with other editors on improving Wikipedia's Luxembourg-related articles, see WikiProject Luxembourg.